The lovely and almost royal color of the tanzanite gemstone is made to stand out in this silver tanzanite stackable beaded ring from Apples of Gold Jewelry. The 14K white gold band features a beaded look that appears as a string of beads connected together to create the 2mm wide ring, while five genuine tanzanite stones sit on the top. The 2mm tanzanite gemstones are each rated A, creating a wonderful and exciting look that stands out in .925 sterling silver. 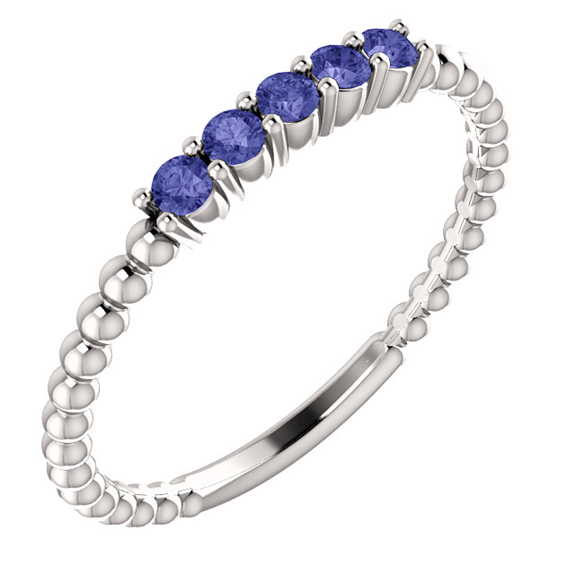 We guarantee our Silver Tanzanite Stackable Beaded Ring to be high quality, authentic jewelry, as described above.